This is our way of saying — we ain”t got nothing for ya today. Before you go and cruise to that Jonas Brothers forum that James moderates, we have a request. Since it turns out that you happen to know what you like to read about better than we do (weird, I know), there”s a comments link at the end of every post where you can leave your thoughts about what we”ve written, filmed or photographed. 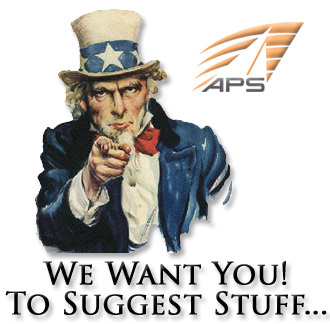 In the comments section for this post we”re asking you to leave us your request for a comparison/test of products that we have here at APS. For example, when we did this post about carbon tiller extensions, it was by far our most popular post ever on the blog and people were coming into the shop saying that it was really cool. But that was our idea of what we thought you”d find interesting — mercifully you did too. Seeing as we”re a blog of the people though, and instead of taking educated stabs at what you want to read, we”re electing to put you in the drivers seat. What do you want us to compare on your behalf? If you could “do this” to compare products, what would you do? One caveat: please keep in mind that we”re not running a fully funded Mythbusters lab here — try to keep the requests reasonable. We”re not really in a position to test out whether Forespar or Forte Carbon Blanks hold up better to the combined weight of four Oompa Loompa”s from the 1971 version of Charlie and the Chocolate Factory featuring Gene Wilder, Jack Albertson and Peter Ostrum. Nor will we be all that eager to fire tennis balls at a TackTick display to see how long it takes to break. Sure, we”re 1000pen to screwing with the boss” stuff/inventory and blaming the new summer staffers if anything breaks, but there”s still limits to what we”ll do. So with that in mind, have it at Stern Scoop Nation. Let us know what you want from us! I would like to see a comparison test of the various types of hiking shorts and pants that you carry. Zhik vs SEA neoprene vs SEA airprene vs Sailing Angles, including a discussion of the relative benefits of the 4 different styles of Zhik hikers. How about a foul weather gear comparisson. Compare them based on fit, dryness, and breathability. Buckets of water, and water hoses should do the trick. You may also want to look at how different brands fit different body types. Another test idea could be rigging knives. use some scrap line, and see how the top three selling knives compare. You're not Underwriter's Laboratories, but compared to some stuff Practical Sailor puts out you might as well be Mythbusters. Glad to know you're open to feedback though. -Thorough, scientifically valid tests. Maybe you can't test something exactly as it would be in vivo, but surely you can think of more sophisticated tests than the aforementioned crowd can (without even making us buy a magazine). Still need a post on the hiking pants for lasers. I want 3/4 waist lock…SEA has em but Zhik doesn't. I have been wanting the zhiks so long now and would buy in an instant. I need some more info to help me decide if this is a crazy desire. Again, with WOMEN trying em on, because no one is the same in the hips. Specifically, I want them to be tried on someone on the boudaries of the fit charts and try it out on a laser or laser hiking bench. I'm worried about batten placement and comfort and heat regulation/breathability. mainsheet line. no kinks. comfortable. fast. Great ideas, everyone. We're actually carving out some time tomorrow (Friday) to sit down with these ideas and come up with ways to pull all of them off in a cool/useful/informative way. We'll work them into the schedule (really, we do have one) and roll them out on our Tech Tuesday's.